UNITED NATIONS (IPS) – Caught in the grips of a summer heat-wave, in a season that is seeing record-high temperatures worldwide, residents of the war-torn city of Aleppo in northern Syria are facing off against yet another enemy: thirst. The conflict that began in 2011 as a popular uprising against the reign of Bashar al-Assad is now well into its fifth year with no apparent sign of let-up in the fighting between multiple armed groups – including the Islamic State in Iraq and Syria. Caught in the middle, Syria’s civilians have paid the price, with millions forced to flee the country en masse. Those left inside are living something of a perpetual nightmare, made worse earlier this month by an interruption in water supplies. While some services have since been restored, the situation is still very precarious and international health agencies are stepping up efforts in a bid to stave off epidemics of water-borne diseases. “These water cuts came at the worst possible time, while Syrians are suffering in an intense summer heat wave,” Hanaa Singer, Syria representative of the United Nations Children’s Fund (UNICEF), said in a statement released Thursday. An estimated 3,000 children – 41 percent of those treated at UNICEF-supported clinics in Aleppo since the beginning of the month – reported mild cases of diarrhoea. “We remain concerned that water supplies in Aleppo could be cut again any time adding to what is already a severe water crisis throughout the country,” Singer stated on Jul. 23. The U.N. agency has blasted parties to the conflict for directly targeting piped water supplies, an act that is explicitly forbidden under international laws governing warfare. As it is, heavy fighting in civilian areas and the resulting displacement of huge numbers of Syrians throughout the country has been extremely taxing on the country’s fragile water and sanitation network. There have been 105,886 cases of acute diarrhoea in the first half of 2015, as well as a rapid rise in the number of reported cases of Hepatitis A. In Deir-Ez-Zour, a large city in the eastern part of Syria, the disposal of raw sewage in the Euphrates River has caused a health crisis among the population dependent on it for cooking, washing and drinking, with UNICEF reporting over 1,000 typhoid cases in the area. To date, UNICEF has delivered 18,000 diarrhoea kits to help sick children and is now working with its partners on the ground to provide enough water purification tablets for about a million people. With fuel prices on the rise – touching 2.6 dollars per litre this month in the northwestern city of Idleb – families pushed into poverty by the conflict have been forced to cut back on their water consumption. Water pumping stations have also drastically reduced the amount of water per person – limiting supplies to just 20 litres a day. 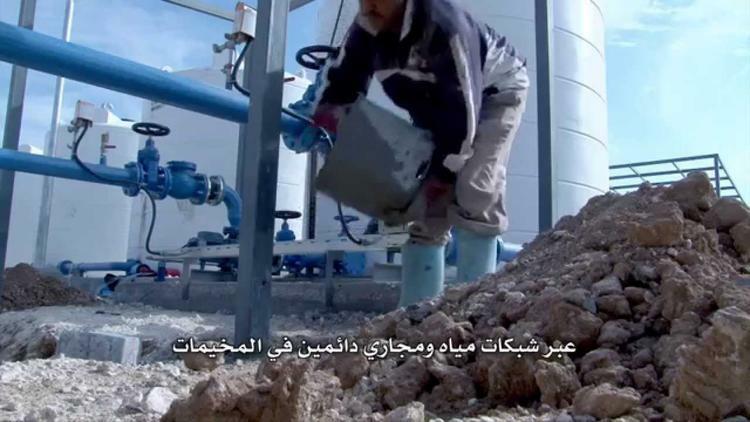 UNICEF’s efforts to deliver water treatment supplies took a major hit earlier this year when the border crossing with Jordan was closed in April, a route the agency had traditionally relied on to provide half a million litres of critical water treatment material monthly. Despite this setback, the Children’s Fund has trebled the volume of emergency supplies from 800,000 to 2.5 million litres of water a day, amounting to 15 litres of water per person for some 200,000 people. Organisations like OXFAM, the Syrian Arab Red Crescent and the International Committee of the Red Cross (ICRC) are all assisting the United Nations in its efforts to sustain the Syrian people. In addition to trucking in millions upon millions of litres of water each month, UNICEF has also helped drill 50 groundwater wells capable of proving some 16 million litres daily. Still, about half a million Aleppo residents are at their wits’ end trying to collect adequate water for families’ daily needs. Throughout Syria, some 15 million people are dependent on a limited and vulnerable water supply network.